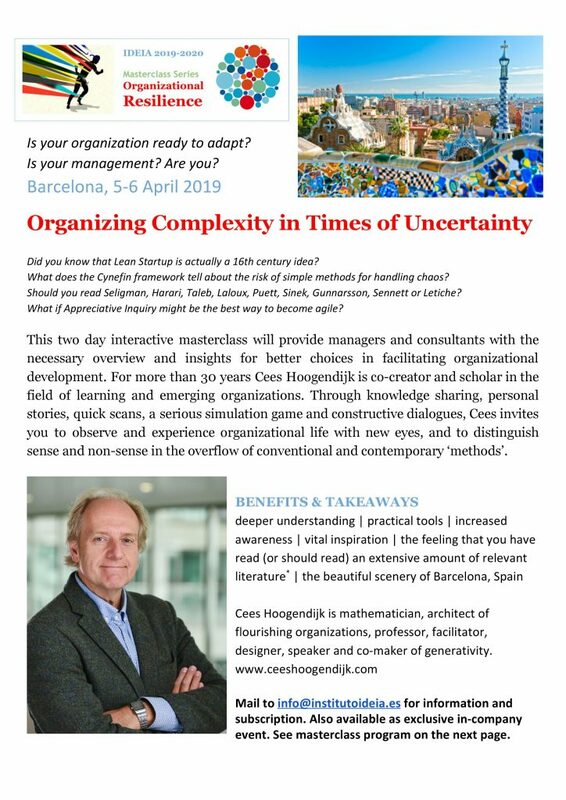 Organizing Complexity in Times of Uncertainty. Barcelona, 5-6 April 2019. Is your organization ready to adapt? Is your management? Are you? This two day interactive masterclass will provide managers and consultants with the necessary overview and insights for better choices in facilitating organizational development. For more than 30 years Cees Hoogendijk is co-creator and scholar in the field of learning and emerging organizations. Through knowledge sharing, personal stories, quick scans, a serious simulation game and constructive dialogues, Cees invites you to observe and experience organizational life with new eyes, and to distinguish sense and non-sense in the overflow of conventional and contemporary ‘methods’.